This song a favorite romantic British ballad. 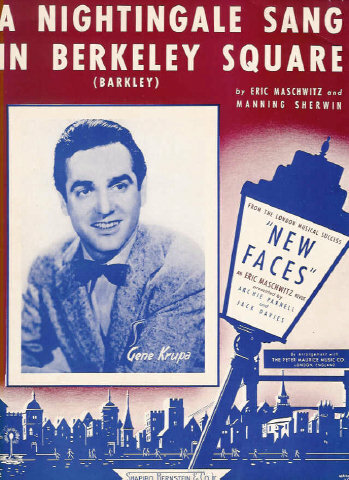 It was introduced in London in the 1940 revue New Faces by Judy Campbell. Glenn Miller recorded it with Bob Eberly and introduced the song to American audiences. The song was quite popular during World War II and was recorded widely during that period. Significant recordings include those by Ray Noble, Frank Sinatra, Mel Tormé, Anita O’Day, Rosemary Clooney, and Nat “King” Cole. Songbirds sing; winter turns to spring. Every winding street in Mayfair falls beneath the spell. That night in Berkeley Square. “A Nightingale Sang in Berkeley Square” was recorded in June 1992 and was released that year on Perfectly Frank. It was arranged by Ralph Sharon.